When the First Congress of Soviet Writers opened on Aug. 17, 1934 in Moscow, it marked a watershed in Soviet literature. The artistic freedom that had characterized the turbulent 1920s was now gone, replaced by forced membership of the Soviet Union of Writers – a puppet organization that reported directly to Stalin. This idea of uniting for one great aim – furthering the revolution – was just a smokescreen, however. In reality, these organizations were a means for Stalin to achieve his political aims. He realized that he could easily control and censor single unions and force them to produce the kind of art that he approved of. The early 1930s were tough years for the Soviet economy, but the First Congress had a budget of 1.2 million rubles – equivalent to the annual salary of 754 factory workers – and was attended by 591 delegates from 52 countries. The government covered all the delegates' expenses and provided a full program of excursions. The location was the Pillar Hall of the House of Unions, which was decked out with portraits of famous Russian writers and poets. Attendees at the congress included Boris Pasternak, the foremost Soviet poet of the time, the “Red Count” Alexei Tolstoy, a nobleman who adjusted to the demands of Soviet power, future Nobel laureate Mikhail Sholokhov, and leading children's author Korney Chukovsky. Gorky also placed heavy emphasis on politics. He criticized bourgeois life, attacked fascism, quoted Stalin and appealed directly to him, ending his speech by glorifying the leader. His words drew a mixed reaction: some writers agreed, while others criticized him for playing up to the government. Nikolai Bukharin's speech also caused a stir. Bukharin, the editor-in-chief of the popular Isvestia newspaper, was an old Bolshevik who had been kicked out of the Politburo by Stalin a few years earlier. He spoke about Soviet poetry for three hours, referencing taboo Silver Age poets such as Nikolai Gumilev – who had been executed in 1921 – Alexander Blok and Andrei Bely. Considering that the congress was designed to further orthodox writing, this speech was not well-advised and probably hastened his downfall. Bukharin was executed a few years later. Andrei Zhdanov, Stalin's right-hand man, tried to convince the leader that everyone, including skeptics, had “liked the congress very much,” but a cursory look at the writers' correspondence – which the NKVD intercepted as part of their broad spying program – showed Stalin that this wasn't the case. The secretary of the then Union of Writers, Alexander Scherbakov, wrote: “I could stand that only for half an hour. I felt sick and left.” Writer Mikhail Prishvin noted that the speeches were “unbearably dull,” while Isaak Babel felt that it was a “requiem for literature.” Boris Pasternak said he was disappointed that so much time was given over to politics rather than solving issues in literature, but he still found some of the arguments and debates interesting. For such a massive event, the congress only made minor ripples in society. Several newspapers published transcripts of the speeches but didn't add any analysis. Many writers left Moscow after the event, going on vacation or supposedly to start work on new projects. The lack of discussion and literary news led Zhdanov to complain that it seemed like the participants had taken a vow of silence, and the Party even published a decree that there should be more press coverage of the event. With hindsight, it seems likely that many writers simply didn't want to lie about their true opinion of the congress or put themselves at great risk by criticizing a government-approved event. The congress marked a turning point in Russian literature. It formulated the principles of a new style in literature, socialist realism. Socialist realism is a style of realistic art that was developed in the Soviet Union and implemented in visual arts, literature, music and even architecture. Unlike social realism, which deals with subjects of social concern, socialist realism is aimed at glorifying the people's struggle for rights and freedom and depicting the building of a new Communist world. Originally, the congress was supposed to take place every three years, but it was postponed many times. In fact, the next event was in 1954, after Stalin's death. This was no coincidence: one congress was enough for Stalin to achieve his goal of bringing writers to heel. A third of the original delegates died in the 20 years between the first and second congresses. Some died from natural causes, and others were killed during the war. However, the overwhelming majority were executed or died in prison or labor camps. 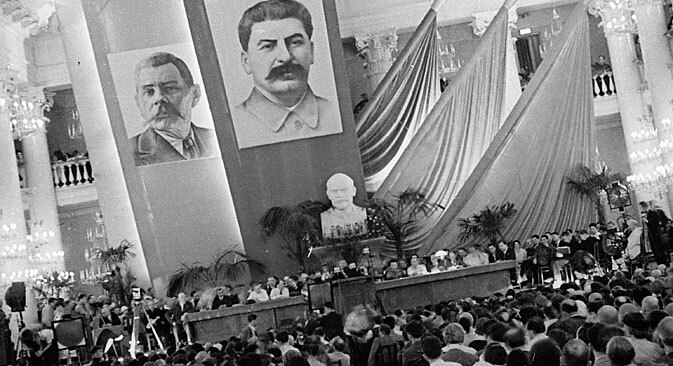 There were only eight congresses between 1934 and 1986, and they increasingly became formal events with almost no influence on Soviet culture. The First Congress was unique in its own way – it was the first and last successful attempt to unite all the writers of one country. This article was amended on Sept. 3 to add additional information about Socialist realism.